Seville Airport (IATA: SVQ, ICAO: LEZL) (Spanish: Aeropuerto de Sevilla) is the sixth busiest inland airport in Spain. 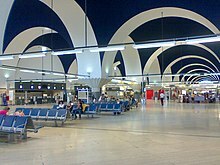 It is the main international airport serving Western Andalusia in southern Spain, and neighbouring provinces. The airport has flight connections to 42 destinations around Europe and Northern Africa, and handled 5,108,807 passengers in 2017. It serves as base for the low-cost carriers Vueling and Ryanair. It is 10 kilometres (6.2 mi) east of downtown Seville, and some 110 kilometres (68 mi) north-east of Costa de la Luz. Seville Airport is capable of handling six million passengers a year. There are 23 stands (all of them are self-maneuvering) of which 16 are remote, with 42 check-in desks and 16 boarding gates. Since its opening in 1991, the airport has undergone minor extension works. 2013 saw the opening of a new car parking building with five floors. In 1929 the first flight was operated between Madrid and Seville and in 1930, this was extended to the Canary Islands. In February 1931, the service between Berlin and Barcelona was extended to Seville. In December 1933, LAPE began a service between Seville and the Canary Islands. Santa Justa. The whole trip takes approximately 40 minutes. Buses run from 04.30 till 00.45. On the 20th April 2011 a Vueling Airbus A320-200 EC-GRH operating flight VY2220 with 150 from Barcelona to Seville aborted landing due to the nose gear stuck in a 90 degrees position the aircraft performed a low approach and the aircraft made a safe emergency landing on runway 27. The 2015 Seville A400M crash took place near to the airport. ^ Number of passengers including domestic and international. ^ a b "TRÁFICO DE PASAJEROS, OPERACIONES Y CARGA EN LOS AEROPUERTOS ESPAÑOLES – aena-aeropuertos.es" (PDF). aena.es. Archived from the original (PDF) on 2016-03-05. ^ "Ryanair to open Seville base". examiner.ie. ^ "Unimos Madrid con Asturias y Sevilla". billete996.aireuropa.com. ^ "Air Nostrum pone a la venta vuelos de Melilla con Almería, Granada y Sevilla". eldiario.es. ^ "Nueva conexión con vuelos entre Vigo y Sevilla". Galiciapress.es. ^ "Vueling expands operations in Seville, basing fourth aircraft and adding Asturias service". centreforaviation.com. ^ "Airport Bus Timetable" (PDF). TUSSAM.es. Archived from the original (PDF) on 2015-06-16. Retrieved 9 August 2015.